Loved this place! 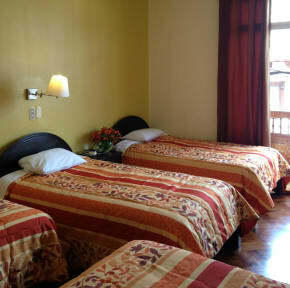 Great location, quiet, and clean rooms. Water pressure for showers was probably the best I had in Peru and the showers were quite hot as well. The breakfast has fruits, breads, oatmeal, cereal, eggs, and juice so it's a good way to start your day. Would gladly stay here again. This was by far our favourite hotel in Cusco. It was clean, quiet, great location to the city centre and the breakfast was AMAZING! Would definitely recommend staying here to anyone - you won't be disappointed! I absolutely loved my stay at this hostel! Extremely friendly and accomodating staff, clean and spacious rooms, awesome free breakfast, cheap laundry service, perfect location! Highly recommend!! Great staff and great location for seeing all of the points of interest in Cusco! This is more like a hotel than a hostel. There aren’t really any communal spaces other than the breakfast area. The room was really big and clean! Awesome water pressure and very clean. The location is perfect and we found the staff really helpful. They advised how much taxis different places should cost, called ahead to confirm hours of a llama farm we wanted to see, and recommended restaurants. Would definitely stay here again! Great place to stay. Extremely close to the Plaza de Armas. Very clean. The metal doors on the room were a bit thin, so if you were stuck with a loud group nearby it might be loud. This wasn't a problem for me and I travel with earplugs. The value of what felt like a hotel room at hostel prices means I will definitely stay here again. When arriving--if the doors are open (ie not after hours) it doesn't look like a hostel because there is art for sale in the foyer. Pass this to the stairs. Very clean. Helpful staff. The location could not have been better. The atmosphere was just okay. Older crowd. Very early check out. But staff helpful and friendly.